Atom offers the ultimate Cyber Security suite that is flexible, easily manageable and brandable. It releases you from the burden of reinventing the wheel and enables you to jump right into the business with the help of our APIs & SDKs which can be white-labeled. We believe in collaboration of technology and innovation creating profitable opportunities for everyone. With more than a decade of experience playing our part in the Cyber Security industry, we now have the ultimate infrastructure to empower others who wish to follow our lead. Venturing out on creating a Cyber Security infrastructure cost you hundreds and thousands of dollars, let alone the cost of its maintenance, but with Atom, you need no hefty capital; instead you share profit as you grow your user base. Atom offers you the option of white-labeling its APIs and SDKs so that you can create your own unique VPN brand and market Atom with any name you desire which better aligns with your vision, brand positioning, and strategic business goals. With advanced features like Next Generation Firewall (NGFW), App filtering, network level Antivirus protection, etc., Atom’s platform offers you services which go beyond VPN, and you can also market them as standalone services. Atom’s platform is developer-friendly and was created with integration in mind facilitating anyone who manages it or aims towards branding it. 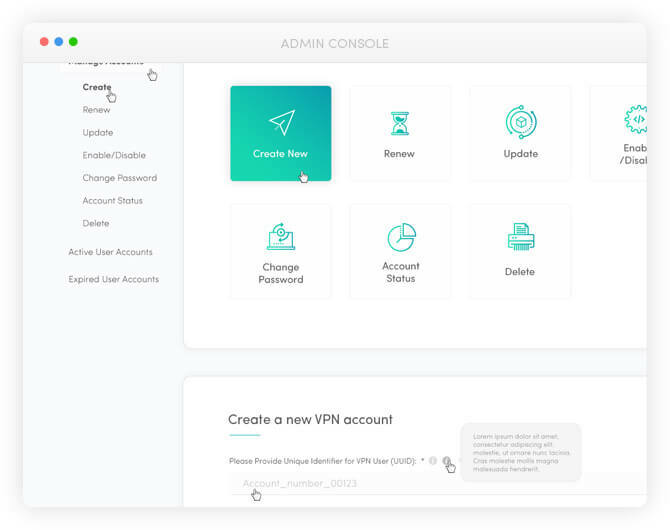 An easy-to-use Admin console is available for the account manager where they have options related to User Management, Statistical Reporting, Session Info, Order History, Payment History, Billing, etc. 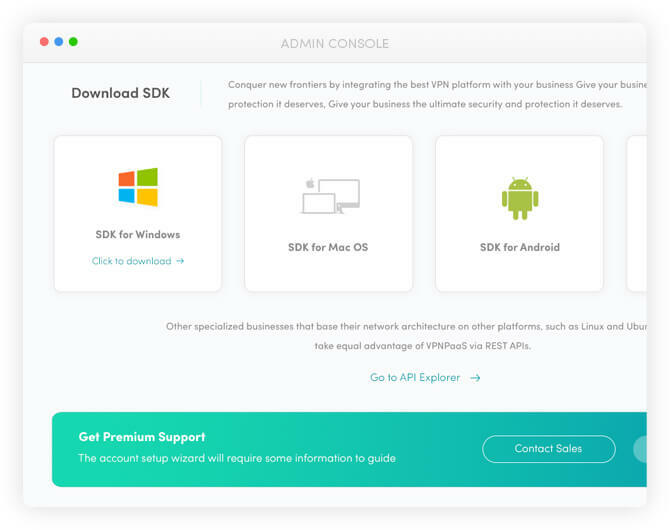 Atom’s easy integration and flexible APIs, SDKs is what enables its vendors/users to harness the power of our infrastructure and utilize our resources. Proper API documentation and installation modules are also provided. 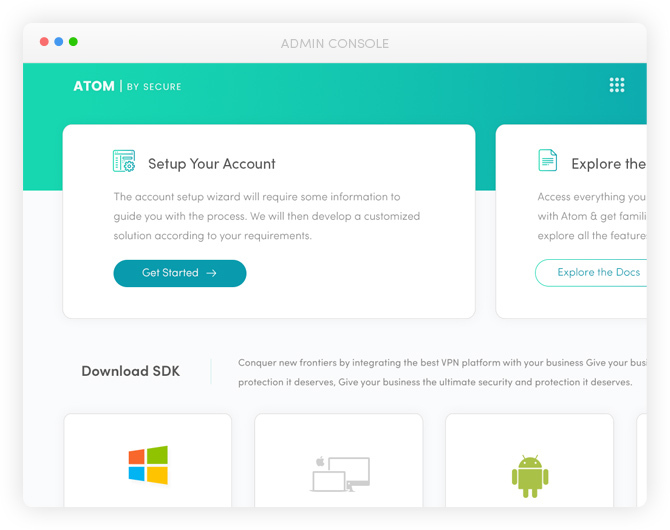 Along with all the essential features that are required by any VPN user, Atom also provides features which go beyond VPN such as Antivirus, App Filtering, Content Filtering, DDoS Protection, Ad Blocker, NGFW, etc. Atom’s secure network and well-maintained infrastructure is spread globally having footprints in more than 98 countries. Atom offers more than 1 million shared IP addresses which can be utilized to access multiple websites online, even those which are inaccessible in your geographic location. By default, every VPN user is assigned a different IP address which is unique to that user. Atom also offers dedicated IPs which can be assigned to any user on the network. Dedicated IPs facilitates the user on a network by giving him/her a clean reputation from the get-go as no one else has ever used that particular IP address. Atom’s dedicated VPN network is spread across in 55+ countries, with 750+ servers strategically located around the globe. Atom’s digital footprints are available in almost every country and continent to ensure users get maximum coverage.